Application fee: $65.00 (U.S.) non-refundable. Copy of passport. If currently in the United States but not studying, a copy of the applicable visa must also be submitted. Instructions follow. Please print this page for future reference. It is vital to use the same name on all correspondence to Indiana State. If you do not have a U.S. social security number, leave this item blank, and the University will assign you a University identification number. Create a new account by providing name, email and password. If you have applied to Indiana State University before, log into the application system using your email address and password. Click on “My Workspace” and then click on “My Applications.” Click on “I would like to create a new application!" Are you applying as an undergrad? Answer "Yes"
App Wizard Step 2: You will see four options. Choose "Undergraduate Non-Degree Application" by clicking "Begin Application" button. Fill in all required fields in the Personal I and Personal II sections. Academic Interest: What is your level type? Answer "undergraduate". What is your student type? Answer "Undergraduate Non-Degree". How will you take courses? Answer "Nondegree/On campus". For which semester are you applying? Educational History: fill in all required fields and list each higher education institution you have attended. Applicant Information: fill in all required fields. The application fee is payable online by Visa, MasterCard, or check or international money order made payable to Indiana State University. 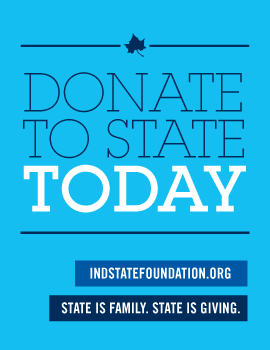 Submit the application fee to the Office of Admissions, Indiana State University. Please note the application fee is non-refundable. For assistance in requesting transcripts from your previous institution(s), use the Transcript Request Form to send to your previous institution(s).